Lev S. Vygotsky, Thought and Language, 218. 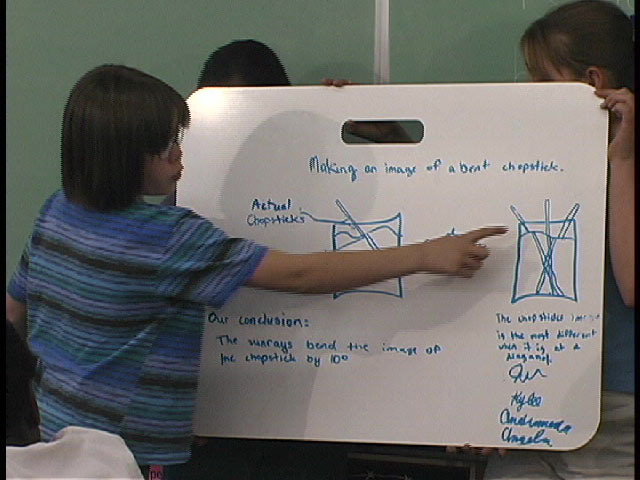 Why should I use whiteboards? foster alternative representations of problems by sketches, graphs, system maps, motion diagrams, pie charts, equations, etc. watch group composition (groups of three; mix ability levels; no fewer than two girls; assign rotating roles such as manager, scribe, critic). Monitor frustration level (thinking is hard work, but anger impedes learning). - Why are we doing this this way? Teacher reads back student responses without answering them. Have students confirm, enrich or paraphrase your restatement. - So you say... Is this correct? - How does this relate to the underlying science (mathematics)? - Where should we go from here? when dialog has changed direction in any group it is time to move on. Your job is to keep dialogue flowing and fruitful. Students can leave class not knowing the answer yet; closure should focus the days activity without short circuiting student thought. saying the right answer is never enough. Explaining the process completes the answer. E.g, why is the accepted answer preferable? How do I grade Whiteboards? 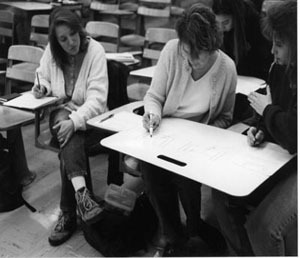 What are the issues arising from Whiteboard use? Arons, A.B. (1997). Teaching introductory physics. Wiley: NY. Hake, R. R. (1996). Evaluating conceptual gains in mechanics: A six-thousand-student survey of test data. Proceedings of the third international conference on undergraduate physics education, College Park, MD. Hake, R.R. (1992). Socratic pedagogy in the introductory physics lab. Physics Teacher, 30, 546-552. Hestenes, D. (2000). Private communication. Rader, J. L. (2000) Private communication. Sawada, D., Piburn, M., Falconer, K., Turley, J. Benford, R., Bloom, I. (2000). Reformed Teaching Observation Protocol (RTOP). ACEPT IN-01, http://physicsed.buffalostate.edu/pubs/RTOP/ . Sawada, D. and Piburn, M. (2000). Reformed Teaching Observation Protocol (RTOP) Training Manual. ACEPT IN-02, http://physicsed.buffalostate.edu/pubs/RTOP/ . Vygotsky, L.S. (1997). (Revised and edited, A. Kozulin). Thought and language. MIT: Cambridge.